All-new roadster adds pizzazz to the Fiat brand. Fiat’s reintroduction to the US market has been met with a tepid reception. Five years after its return, the Italian marque is struggling, as brand sales are down 18.6 percent through May 2016. Two of Fiat’s three models are presenting a tremendous drag on sales. Demand for the diminutive Fiat 500 is off by 48 percent; Fiat 500L sales have plunged 62.8 percent. Offsetting some of that loss is the 500X, a subcompact crossover SUV introduced a year ago and sharing its underpinnings with the Jeep Renegade. Fiat 500X sales are set to overtake the 500, but it won’t be nearly enough to stop the loss. This month, a fourth Fiat model arrives — the 124 Spider. The name should be a familiar one to Fiat faithful as this roadster was introduced nearly 50 years ago. For 20 years the 124 Sport Spider soldiered on, receiving several updates along the way. Coupe and convertible versions were sold in the US beginning in 1968. Production ended in 1985, succeeded a decade later by the Fiat Barchetta before the latter was discontinued in 2005. 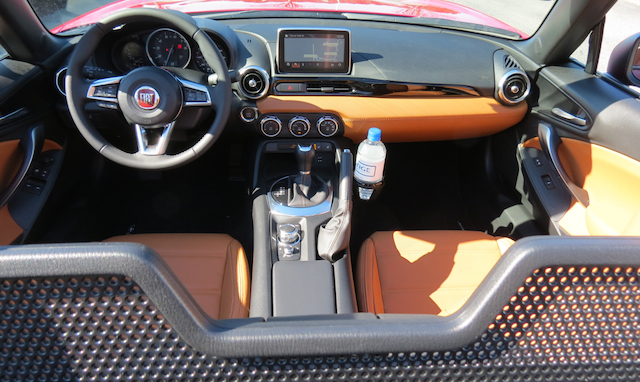 Some believe Fiat is well-served with a roadster in its product line. However, the current arrangement for Fiat Chrysler Automobiles doesn’t permit such an expensive investment in a risky segment, but that hasn’t precluded FCA from forging a joint venture with Mazda to obtain one. The first model in that venture is the Fiat 124 Spider, a roadster sharing its underpinnings with the fourth-generation Mazda MX-5 Miata. There is some risk here for both automakers. On the one hand, Fiat may not enjoy quite the sales lift it desires. On the other hand, a successful 124 Spider could siphon interest from the MX-5 Miata. No matter, Mazda should come out a winner as it recoups some of the cost of building this roadster. 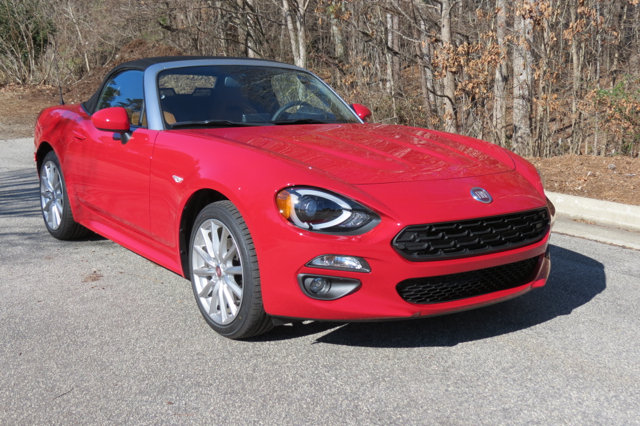 The 2017 Fiat 124 Spider is powered by a 1.4-liter, turbocharged four-cylinder engine. It comes paired with a 6-speed manual or an available Aisin 6-speed automatic transmission. Three trims are offered — Classica, $24,995; Lusso, $27,495; and Abarth, $28,195. A special introductory Prima Edizione in Azzurro Italia (dynamic blue mica) launch edition with 17-inch, silver-painted premium aluminum wheels will kick things off. Just 124 models will be built with the price pegged at $35,000. All 124 Spiders are outfitted with 16- or 17-inch wheels. A dual-tip exhaust is standard as is a roll bar, the latter painted in black in the base model. Halogen headlamps and LED taillights are standard. Cloth or leather seats are included, depending on the model. The Abarth edition receives special exterior colors, front and rear Bilstein sport suspension, quad-tip exhaust, and unique front and rear fascias. This model also gets a very slight boost in performance, 164 horsepower up from the standard 160. All models produce 184 foot-pounds of torque. Available features include a Brembo braking system and Recaro seats. 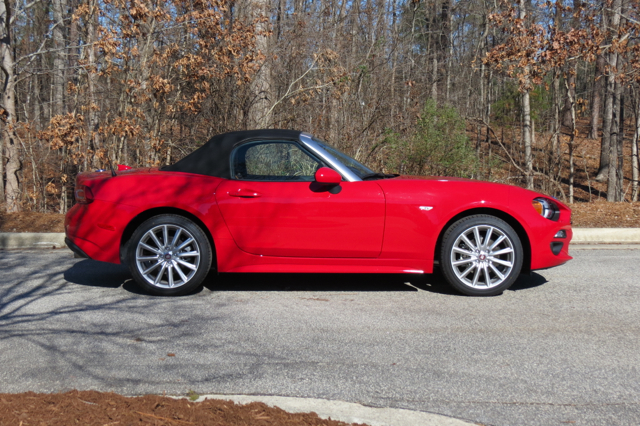 There is no word on how much FCA paid Mazda to develop the 124 Spider. Nor do we know if the venture will produce other models. But collaboration in the auto industry is rife and small-time Mazda and suitor-seeking FCA should both benefit regardless where this relationship is headed. Photos copyrights Auto Trends Magazine. All rights reserved.